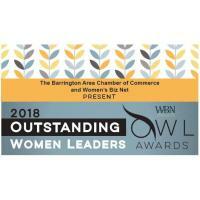 The Barrington Area Chamber of Commerce (BACC) Women’s Biz Net (WBN) will honor four local women leaders during the Chamber’s inaugural Outstanding Women Leaders (OWL) Awards Luncheon on September 27, from 11:30 a.m. – 1:00 p.m. at the Biltmore Country Club, 160 Biltmore Dr. in North Barrington. Tickets to the luncheon program are $35 and can be purchased online at www.BarringtonChamber.com. The first class of OWL Award Recipients to be recognized at the luncheon are: Karen Lambert, President of Advocate Good Shepherd Hospital, for Professional Excellence; Joy Wagner, RN, BSN and Founder of fitMS® NeuroBalance Center, for Community Impact; Susan McConnell, Founder and Executive Director of Let It Be Us, for Nonprofit Leadership; and Jennifer Prell, Founder and President of Paxem, Inc. and Elderwerks, for Mentorship and Education. The OWL Awards were created by the BACC WBN Council to recognize women for their inspiring work in one of four categories: Professional Excellence – excelling in their profession and setting the standard in their field; Community Impact – giving back and making an impact on the Barrington Area community; Nonprofit Leadership – working to provide important resources to the community and excelling an important cause; and Mentorship and Education – mentoring and improving the lives of others through education. Karen Lambert is president of Advocate Good Shepherd Hospital, an institution that has earned numerous distinctions under her leadership, including Magnet nursing designation and recognition among the Nation’s 50 Top Cardiovascular Hospitals by Truven Health Analytic. Joy Wagner, RN, BSN, is founder of fitMS® NeuroBalance Center, a not for profit 501(c)3 public charity started in 2010 to provide services to address the unmet needs of the Multiple Sclerosis (MS) population and all those with Neuromuscular conditions that threaten independence. Susan McConnell is Founder and Executive Director of Let It Be Us, the first nonprofit in the state that is dedicated to the adoption and education of children within the Illinois foster care system. Jennifer Prell is Founder and President of Paxem, Inc., a Senior Move Management and Senior Relocation Company, and Elderwerks, a complimentary service helping to find assisted-living or any type of senior housing or elder care solutions.